Okay, I know that example might connect better with a guy, but you get the point. Let me try that again. What do you do after you’ve crossed the Red Sea of obstacles, only to be dying of thirst at Marah three days later? How do you keep your dancing from turning into disappointment? One thing is for sure; you don’t drive down your tent pegs by the disappointing waters of Marah and camp out there. You move on. I think of the women on Jesus’s ministry team. They had committed their lives to the Messiah and believed that He would restore Israel. Mary Magdalene and a handful of other women had followed him for over three years. But life had not turned out like they thought it would. Their hopes and dreams were nailed to a cross and the lifeblood spilled on the ground to be trampled underfoot. Their future lay in a borrowed tomb—sealed behind an imposing stone. It appeared Jesus was not going to be the ruler and set things right after all. The very people He came to save had killed Him. This was not how the story was supposed to go . . . at least in their eyes. So what did Mary and the other women do? On the third day after Jesus’s death, while it was still dark, they got up, gathered their spices and started walking to the tomb. Never mind that it was still dark. Never mind that a giant boulder blocked the tomb’s entrance . . . a stone too heavy for the women to move. Never mind that armed Roman soldiers stood guard over the grave. Never mind that the disciples were so discouraged and disillusioned that they hid away in a secret room. The women didn’t have all the details worked out in their heads, but they were not going to sit home in their discouragement—paralyzed into inactivity. Mary Magdalene got up, and she got going . . . while it was still dark. In the end, she was not disappointed that she took this step of faith, and you won’t be either. Just as assuredly as Jesus met Mary Magdalene at her greatest point of need, He will meet you at yours. Click & Tweet! Did you notice that Mary Magdalene didn’t wait until her circumstances changed before she got moving? Jesus was still dead as far as she knew. But she got up and moved forward anyway. And where did she go? Yes, she went to the tomb, but there is more. She went back to the last pace she had seen Him. Perhaps that is where you need to go today. Go back to the last place you encountered Jesus. Even if it is still dark. Even if you are still in a dark place. Even if a seemingly impossible imposing boulder of disappointment is blocking your dreams. Don’t worry about moving the stone. God’s good at moving stones Click & Tweet! . You just keep putting one faithful foot in front of the other and let God take care of the rest. Oh, what we miss when we make camp in the painful place of disappointment and refuse God’s invitation to continue the adventurous journey. We miss the moments of sudden glory when our eyes are shut tight because of discouragement, and our hearts are bolted fast with despair. 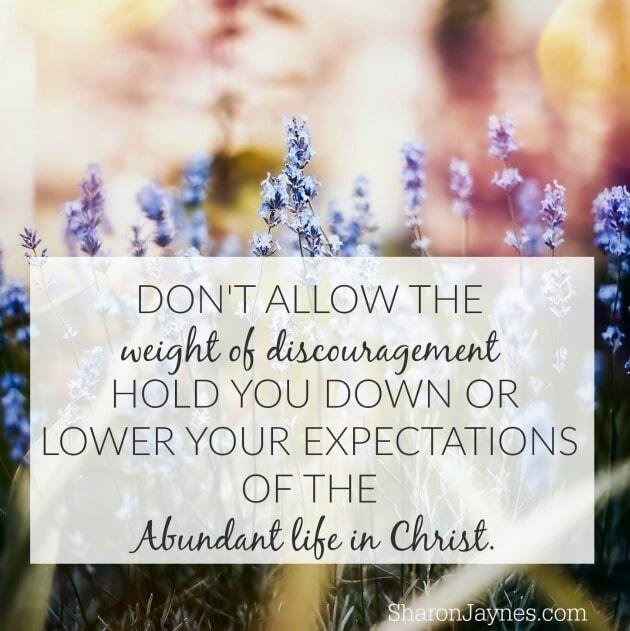 Don’t allow the weight of discouragement hold you down or lower your expectation of the abundant life in Christ. Click & Tweet! There’s more to experience just around the bend. I will be speaking at the following this Spring. I’d love to see you there. Click on the Venue for more details. I’m up. I’m moving and trying to stay positive. I lost my job out of the blue o. Thursday March 9. I walk in and am told immediately that they are going in a different direction leadership wise. Stunned, feelings of betrayal, defeated….but God has a better and different plan. Thy will be done. Same kind of situation happened to me, out of the blue. I am ready! Thanks for the encouragement words Sharon. I’m ready Sharon! I had one of those days when I drove the stakes in and camped in my misery for a while the other day….I call it my Pity Party….and they never go well. It hurts worse, makes me feel terrible when I do that, but some days its like I don’t have the strength to pull myself up….and I forget to ask God to help me. I hate myself when I get that way. Thank you Lord Jesus that He heard my cries for help and pulled me up….sometimes I forget to ask tho and wallow in that misery. I know better, I trust God and know He’ll bring good to the bad….and I still fall into my pit. My upcoming back surgery is causing much stress in my home….please help me pprayer the peace and assurance in our hearts that it will go as God plans and be ok. Thank you Sharon for your gift of God’s message you bring to us…. Blessings! I’m ready. Lord, help me to pack up camp and move with You! Lovely timing, your words from God were encouraging, inspiring, empowering and another confirmation of the promptings which I have sensed in God regarding moving forward within and from my present situation/circumstances. I’m ready! What a timely read! And ALL things work together for good to them that love God and are the called according to HIS purpose…Romans 8:28 I BELIEVE God has a purpose and a plan for my life. Hallelujah! I’m ready…a timely message for me to hear today. When I call on Jesus to help me in my distress, He is always faithful. I needed to hear this today. Hallelujah, to the Lord who makes all things good. I love this post would love to print it. Could you put a print icon for your posts. Thank you for the encouragement Ms. Sharon……..I’m Ready! Thanks Sharon for this timely message. Thank you again Sharon for another great message! I’m ready. I’ve been discouraged for the past several years with my health. Praying God will turn it around soon. I’m so ready I could POP with excitement! I’ve been ready for a long time, but nothing’s happening. My “season” (oh, how I hate that word!) appears to be the normal weather for my life, with no variation. Lord I am ready for mourning to be turned into dancing…I am ready! Thank you for this encouragement…I was truly blessed by it. I’m ready please help show me the way!!! Thank you for a word in season. I really needed that encouragement this morning. Have a Blessed day! I’m ready, have gotten up, moving forward with opened eyes and a opened heart.!! I’m always ready, willing, and able for the Lord Mercy and Grace over my life.